Marcy Wilson graduated from Dragon Rises College of Oriental Medicine with a Masters of Acupuncture and Oriental Medicine (MAOM) degree. After passing national boards in acupuncture and herbal therapy, she received certification as a Diplomate in Oriental Medicine by the National Certification Commission for Acupuncture and Oriental Medicine (NCCAOM), which upholds the highest standards for the safe and competent practice of acupuncture. 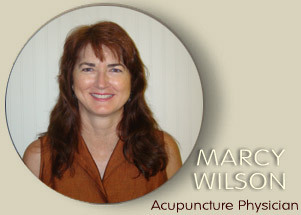 She is licensed by the State of Florida as an Acupuncture Physican (FL AP#2178). Prior to her acupuncture training, Marcy was attuned in Levels I-III of Reiki healing, (see: http://www.reiki.org/faq/WhatIsReiki.html), and incorporates this into her acupuncture sessions as needed. She has two offices to serve you in Gainesville and High Springs, Florida. She also serves the surrounding areas of High Springs, Alachua, Ft. White, Micanopy, Hawthorne, Waldo, Keystone Heights, LaCrosse, Lake Butler, and Melrose. Be sure to check out the full List of Services.